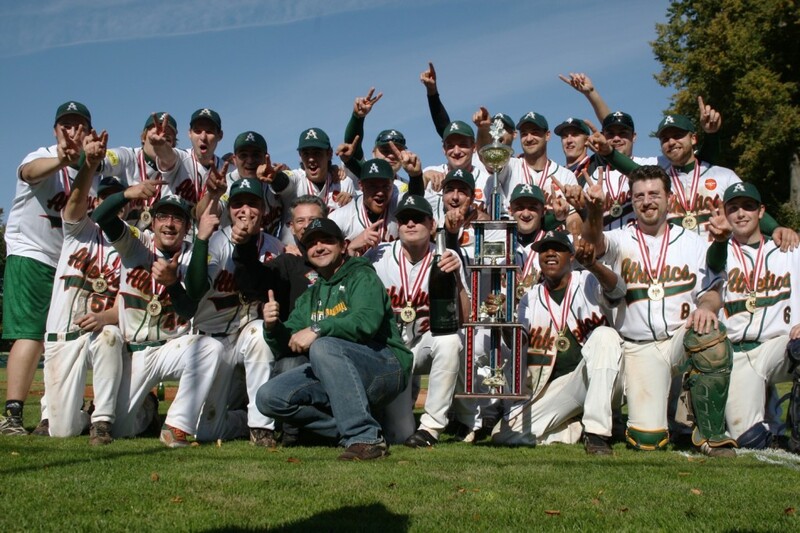 Win: Schrittwieser, T.; Loss: Haisjackl, F.
The Athletics Attnang-Puchheim have won the championship in the Austrian Baseball League for the second time after 2008. They completed the sweep in the best-of-five finals over the Schwaz Tigers on Saturday with a 17-1 ten-run rule shortened lopsided victory. Even though the Tigers took a 1-0 lead on a RBI single by Franz Haisjackl in the opening frame, the A’s never left any doubt about clinching the title this sunny afternoon at the Athletics Ballpark in front of 400 people in attendance. They tied the contest in the bottom of the second through a RBI single by Horst Efferdinger and got up in front one frame later thanks to an error by Schwaz’ shortstop Kevin Konzett. Attnang-Puchheim added a run in the fourth and blew things wide open with five runs in the fifth and nine in the sixth. Martin Rabengruber hit a grand slam in the sixth and drove in five overall. Dave Burns and Harald Pointner crossed the plate three times apiece. Efferdinger and Philipp Dressler combined for three doubles and six RBI. On the mound Thomas Schrittwieser (W 1-0) settled in after a nervous beginning and allowed just two hits, a run and three walks in seven innings. He retired the last 14 batters in a row to seal the win. Franz Haisjackl (L 0-2) surrendered eight hits, eight runs (3 ER) and two bb in 4 2/3 innings to take the loss.